Warning: This post contains lots of statistics and graphs. If this is the sort of thing you are into, then may I recommend the blog Charting Transport. The NSW Bureau of Transport Statistics does 30 year forecasts of transport within the Sydney Metropolitan area every 5 years. The most recent are for 2006-36, based on the 2006 census results (the transport results of the 2011 census have not yet been released), and give an insight into how we are likely to get around. I’ll be looking more specifically at the Sydney statistical division figures, which exclude Newcastle but include the Illawarra. This post looks only at all day transport, not peak hour. Ferries do not appear to be included. The assumptions on which it is based have already changed slightly, with a Second Harbour Crossing now expected to be built instead of the Parramatta to Epping Rail Link, so these figures probably underestimate rail’s proportion of trips to be undertaken. But otherwise the assumptions seem fairly sound. In 2006 there were 16,175,000 trips on an average weekday. Just over 8 million of these were trips made by the driver of a car (50.1% of all trips). Most other trips were either car passengers (20.7%) or made on foot (19.1%), each accounting for just over 3 million trips. The remaining 1.6 million trips were split fairly evenly between rail (4.5%) and bus (4.1%). Taxis, bikes and light rail made up a tiny 203,000 trips (1.2%). All are expected to grow over the subsequent 30 years, and by 2036 there are projected to be 22,160,000 trips per day, an increase of 6 million or 37% on 2006. The proportions are expected to remain roughly the same as in 2006, so the increases are also roughly in line with their share of trips in 2006. Looking just at the increase in trips, there will be an additional 3.3 million by car drivers (56.4% of the increase in trips), 1.0 million by car passengers (16.8%), 0.9 million walking (15.6%), 349,000 on trains (5.9%), 234,000 on buses (4.0%) and 79,000 on taxis/bike/light rail (1.4%). The disproportionate increases are in car drivers, rail and light rail. Note: The first 3 modes of transport (car driver, car passenger and walking) are so dominant, accounting for 90% of all trips, that a second graph is included below showing just the other modes of transport so that they can more easily be read. As mentioned previously, when looking at proportional increases, car driver, rail and light rail modes are projected to see the biggest increases. Light rail sees such a large proportionate increase (521%) that it’s included in a separate graph. This is due to the relatively small size of the current light rail network, which here is assumed to grow to include the Dulwich Hill (by 2016) and CBD (by 2021) extensions. It does not appear to factor in its inclusion in the myZone system, nor possible extensions to the Universities of Sydney and NSW. So it is quite possible that growth could be even higher. However, it should be stressed again that this increase is from a very low base. Other modes of transport are expected to mostly see a steady increase in number of trips, with the exception of rail and bus. Rail growth picks up steam over time, with the strongest growth occurring in the 2020s once the Northwest Rail Link (NWRL) and Parramatta to Epping Rail Link (PERL) are completed. Although the PERL looks unlikely to be built to that timetable, the additional capacity from a Second Harbour Crossing is likely to have a similar if not larger effect on rail patronage during that period. Ultimately, rail trips are projected to grow by 48%. This, together with expansions to the light rail network in the late 2010s means that growth of trips by bus grows rapidly at first while light rail and heavy rail infrastructure is being constructed, then slows once it comes online, growing by 35% over the 30 year period. This will be most obvious on the M2, where the government is expected to remove many bus services once the NWRL is completed, and the CBD, where bus lines are likely to be rerouted to become feeders for light rail rather than travel through the CBD itself. The other large increase is car driver trips, which grow by41%. All other modes are projected to increase by between 28% and 37%. Just looking at the number of trips can be misleading. For example, although rail and bus have a fairly even share of trips, rail trips tend to be much longer than bus trips. Similarly, walking tends to be for fairly short trips. In 2006, the longest average trip was a rail trip of 24.4km, expected to rise 14% to 27.6km in 2036. The average length trip on cars, buses and taxis tend to be in the middle of the pack. Car drivers travelled 9.7km and car passengers travelled 7.6km in 2006, with both projected to drop 7% to 9.0km and 7.0km by 2036. Trips on buses, 8.5km in 2006, are projected to increase by 7% to 9.1km by 2036. Meanwhile, taxi trips averaged 6.3km in 2006 and are projected to fall slightly to 6.0km by 2036. Short trips tended to be on foot (0.9km) or bicycle (3.1km), and their average distance is not expected to change much between 2006 and 2036. Note on light rail: The data says that the average trip for light rail was 18.2km in 2006, rising to 22.6km in 2036, which seems unusual given that the current line is only 7km long, and even when the extension is completed will still be only roughly twice that distance. It might have something to do with the statistical methodology, which looks at distance by “main mode”. Putting the average trip distance together with the number of trips gives us the total number of passenger kilometres travelled on the average workday. In 2006, residents of Sydney travelled a total of 131 million km on an average workday. Here again we see cars travel dominating travel, car drivers travelled 78 million km (59.5% of all passenger km) while car passengers travelled 25 million km (19.3%). Next biggest is rail, with just under 18 million km (13.6%), then bus travel with 5.6 million km (4.3%), and walking with 2.7 million km (2.1%). The remaining 1.0 million km (0.7%) were shared by light rail/taxis/bikes. By 2036 it is projected that Sydney residents will travel 177 million km, an increase of 46 million km or 35% on 2006. This increase is driven mostly by car drivers, with an additional 24 million km (53.0% of the increase), followed by rail with 12 million km (26.9%), car passengers with 5.2 million km (11.3%), and buses with 2.5 million trips (5.5%). The remaining 1.5 million km (3.3%) were shared by light rail/taxis/bikes/walking. Note: Similarly to before, as the car driver category is so dominant, accounting for 60% of all trips, a second graph is included below showing just the other modes of transport so that they can more easily be read. When measuring the proportional increase in total passenger km, it is the public transport modes that have the biggest increases: light rail, rail and buses. As was the case previously, light rail’s increase is off such a low base that it is on a completely different scale to the increase in all other modes of transport, and so is included in a separate graph. Light rail km are projected to increase 670% between 2006 and 2036. The dramatic increase in rail usage is clearly seen here. Other than light rail, it is projected to see the biggest proportionate increase in both number of trips (by 48%) and average distance of each trip (by 14%), resulting in a huge 69% increase in total passenger km. Total bus passenger km also see a modest increase, rising 45% between 2006 and 2036. Other modes of transport are projected to see an increase in passenger km of between 20% and 31%. If the end goal is to increase public transport (buses, trains, light rail) and active transport (walking, bicycles), then these projections show how much of a challenge that is. The proportion of trips on public and active transport are projected to fall from 28.3% to 27.8%, though this appears to be due to an increase in short distance car trips. However, even when looking at total passenger km, that proportion still only increases from 20.2% to 24.1%. Meanwhile, total car km are projected to increase by 31%, meaning that an additional 31% of roadspace will be needed to keep up. Alternatively, existing roadspace could be used more efficiently via decentralisation and/or congestion tolling to encourage a more even distribution of traffic, both over time and over space. Ideally an increase in public transport and active transport use would allow a static car km statistic, meaning less stress on our road system. And lets not forget that this is all a bit of a chicken and egg exercise. Bureaucrats predict increasing car usage and call for more roads to handle the additional traffic. New roads result in an induced demand for people to drive rather than taking public transport. The forecasts become a self-fulfilling prophecy, and meanwhile the additional traffic mean a return to the congestion that the new roads were meant to eliminate. Prior to the 2011 NSW state election, the current Liberal Government promised to build either the M4 East or F3 to M2 Link, or to duplicate the M5 East. To decide which one of the 3 would be built, Infrastructure NSW has been tasked with determining which was most appropriate. That report is to be finalised in September. As a result, it is speculated that tolls will return to the M4, and be introduced onto the M5 East in order to fund the construction of new roads. Such tolls would raise $250m per year and, together with $2.4 billion raised from electricity privatisation, would pay for the duplication. Further North, it is speculated that a new freeway linking the F3 to the M2 would be privately built and operated. The government has been in talks with Transurban, the owner of the M2 and Lane Cover Tunnel and also part owner of the M7, M5 and Eastern Distributor, over the possibility of building such a freeway. This raises the question over the role of tolls. On one hand, they serve as an excellent form of user pays funding – those that use the freeway are those who pay for its use. And lets not forget that making road usage free while charging for public transport only discourages people from taking the train or bus while encouraging car use. While people should be free to drive, it is also not something that should be encouraged by subsidising it via toll free freeways. At the same time, a large portion of the community benefit from the existence of a freeway, as it removes cars, traffic and congestion from local streets. Look at the Lane Cove portion of Epping Road, which has seen a big drop in traffic and a reduction in speeds following the opening of the Lane Cove Tunnel. Ultimately the question therefore becomes not one of “Should there be a toll?” but rather “How much should the toll be?”. And it is here where the problem emerges – many of Sydney’s freeways are privately owned (M2, Lane Cove Tunnel, M5, M7, Cross City Tunnel, Eastern Distributor and Harbour Tunnel), with tolls set based on contractual agreements entered into at the time of construction. Some of these are set to revert to public ownership in the next 10-15 years, but others still have decades left before that happens. In the past this has meant the M4 and M5 have been free (or had a cash back system in place), while freeways North of the Harbour (M2, Lane Cove Tunnel and the Harbour Bridge/Harbour Tunnel) were all tolled. Any government that can untangle this mess of contracts, tolls and financing, and come away with a city-wide tolling system that will fund the construction of future roads will have done what is generally considered impossible. For that reason, don’t expect it to happen. Pedestrianisation of George Street would involve the replacement of buses from George Street between Bathurst and Hunter Street with light rail. 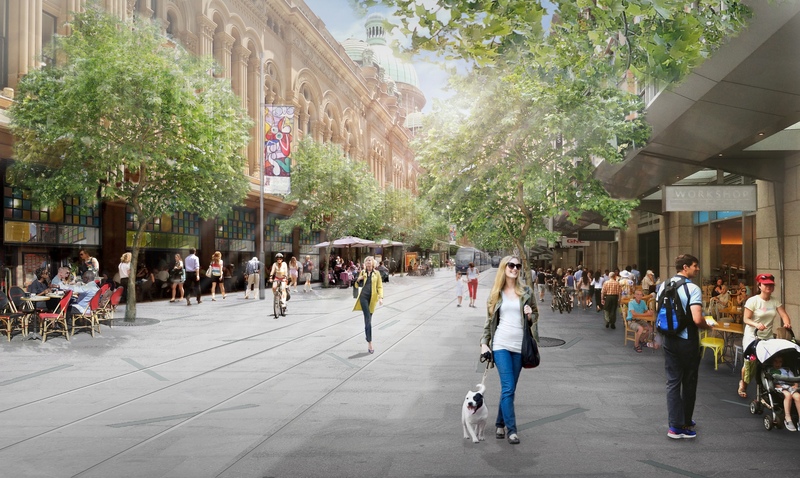 The pedestrianisation of George Street, such as happened in Martin Place and Pitt Street Mall, has been a long term goal of City of Sydney Lord mayor Clover Moore, as part of her 25 year Connecting Our City plan for Sydney. Despite the City of Sydney Council’s continued push for pedestrianisation, the state government has yet to state a position either in favour or opposition to the idea, choosing instead to wait on the release of its light rail feasibility study first. The concept of pedestrianisation is opposed by some, such as former Parramatta Lord Mayor David Borger, whose council returned cars to the formerly pedestrianised Church Street Mall in Parramatta in 2007. However, it does have the support of businesses, with the Australian National Retailers Association and Committee for Sydney coming out in support. Parramatta Road, the 20km link between Sydney’s 2 CBDs, is considered the worst road in Sydney: high levels of congestion result in long travel times and an unattractive place for people to live, eat and shop in. In my experience, congestion on weekends can be as bad or worse than during weekday peak hour. This has led to multiple proposals for improving the long strip (here, here, and here). The most recent of these proposals comes from The Urban Taskforce, a lobby group for property developers. It calls for 100,000 new apartments and 100,000 new jobs along Parramatta Road. Such a change would be contingent on 2 things: (1) the construction of the M4 East to take surface traffic away from Parramatta Road, and (2) the creation of a new authority to oversee Parramatta Road, which is currently under the jurisdiction of 9 separate local councils. The changes would see 6 storey buildings on either side of the road, with 12-20 storeys further back and the occasional 25 storey tower to punctuate the streetscape. 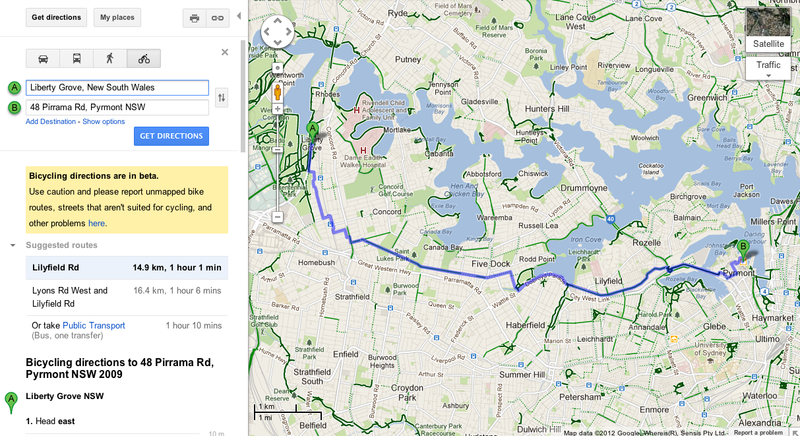 A metro or light rail would improve transport along the Parramatta Road corridor. A video by the Herald outlining the proposal is worth watching. Another proposal was made by the NRMA last year, in which it suggested that Parramatta Road would be narrowed from 6 lanes to 2 lanes, allowing for trams to run in their own exclusive right of way as well as bike paths and a widened footpath. In both cases, self interest is clear: developers want to be the ones to build those 100,000 apartments being proposed and the NRMA wants the M4 East completed that would be a requirement for this to happen. That said, self interest doesn’t automatically make this a bad idea. In fact, in this case it’s actually quite a good proposal. First, a bit of background on Sydney’s population. According to the 2011 Metropolitan Strategy for housing, Sydney’s population will increase by 1.7 million people by 2036 and will need an additional 770,000 homes. This represents an increase in population of about a third, and an increase in housing of about a half. The disconnect between the two is due to a fall in the average household size, with single person households in particular expected to rise from 23% to 30% of all households. Only 30% of new homes (230,000) will be new areas in greenfield sites, and the majority of these (180,000) will be in the Southwest and Northwest Growth Centres. The other 70% will be infill developments in existing urban areas of Sydney, the most prominent of which is Green Square, which will provide 20,000 new homes. Greenfield housing is more likely to be low density houses with larger average household sizes (3-4 people per house), while infill housing is more likely to be higher density apartments with smaller average household sizes (1-2 people). The Urban Taskforce proposal to build 100,000 new homes therefore represents almost 20% of the infill housing stock required for the next 25 years. But the question remains: if Parramatta Road is so bad, why is it a good idea to make it worse with so much development along it? This is where the NRMA proposal comes in. One of the things that it argues for it that the increased government revenue (stamp duties, land tax, parking levies, etc) from development along Parramatta Road should be sufficient to pay for the cost of building the M4 East and a light rail line along Parramatta Road. This would take traffic off Parramatta Road and provide a frequent and rapid mode of transport as an alternative to a private car. The reality of urban and transport improvements is that they do increase the value of private properties in the area, yet this increase in value is generally to the exclusive benefit of the property owners while the cost of building the infrastructure is borne by the taxpayers. So what this proposal is trying to do is use this increase in private value to pay for public infrastructure. Another innovative way of paying for new transport infrastructure can be seen across the Pacific in the traditionally car dominated city of Los Angeles. Its mayor, Mayor Antonio Villaraigosa, has been making a big push to improve public transport there, including new transport infrastructure that will take 30 years to fund via a sales tax increment. However, he wants to build it in 10 years by borrowing from the federal government and then paying them back over 30 years from that same revenue, a strategy dubbed the 30/10 proposal. It’s attractive to the federal government because its a form of financing rather than spending (i.e. they get their money back) while also attractive to LA residents as they get access to cheap loans (since the US government gets lower interest rates than a city government) and receive the benefits sooner rather than later. This is actually not disimlar to how freeway construction is funded, by borrowing money to construct it and then paying it back over many decades through tolling. In the context of the Parramatta Road proposal, bringing forward projected tax revenues from future developments in order to fund the infrastructure improvements required to make those developments viable could be just the solution that the Parramatta Road problem needs.